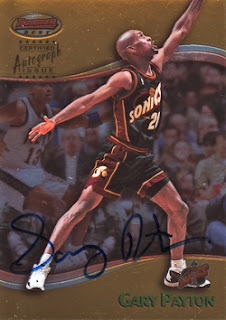 In the mail today was an addition to another 90s autograph chase that I currently have on the go. 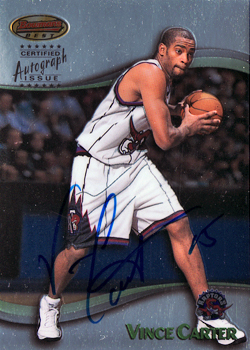 The 1998-99 Bowman's Best Autograph card of Mike Bibby, arrived to join seven other cards I currently have from this nine card insert set. I started to put it together after breaking a couple of boxes when the product was first released and pulled a the Michael Doleac version; which considering the cards were issued at 1:568 packs felt like a pretty amazing pull at the time! Despite these odds, the cost of these cards are currently not that high; the Kobe Bryant has a Beckett BV of $120, with the Mike Bibby only valued at $15. 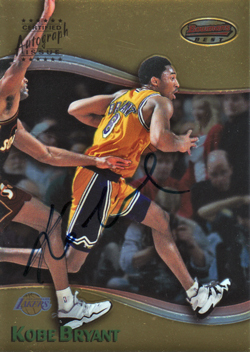 The cards, which feature the same design as the original base and rookie cards from the underlying set, are not really suited to displaying the player's autograph. Consequently, it could be argued that, when compared to more recent releases, they are not that attractive. But I feel this means they have a 'through the mail' feel to them, as opposed to a professionally designed autograph release that are commonplace today. To complete the set, I am on the look out for the Tim Duncan version. So if anyone reading this, has one for sale / trade at a reasonable price, then drop me a line. Bookmarking this blog- will enjoy seeing your progress on these great sets! Ryan - thanks for comments; glad to have you aboard! I've added your blog to my links and will be checking in with yours regularly.